When Jakob was a boy, the last thing his mother said to him as she hid him underneath a covered table was not to come out, no matter what. In the moments that followed, Jakob watched as his mother took a rifle to her head, his father then shot dead and his older sister was dragged out of their home by her hair. It’s no wonder Jakob would grow up to become a man who lives his life as if he were still cowering under that same table. The connection between past and present centers the vast story of Canadian director, Jeremy Podeswa’s FUGITIVE PIECES. Based on the prize-winning novel of the same name by Anne Michaels, Fugitive Pieces follows Jakob from his childhood through the rest of his life, from his escape from Nazi-controlled Poland to his exile in Greece alongside his surrogate father, Athos, and finally to Canada, where he will live out the rest of his tormented years. The film’s beauty can easily be found in the sweeping shots of the Greek Islands or the intrinsically linked performances of Jakob, young and old (young, Robbie Kay, old, Stephen Dillane) but its purest form of beauty comes from the manner in which it is told. Rather than allow the events to unfold chronologically, Fugitive Pieces tells Jakob’s story in precisely that, pieces. They are fragmented but still connected through the spirit of a man who not only had to endure atrocities but move past them in order to live instead of just survive. Canadian filmmaker, Jeremy Podeswa, has found himself on the cusp once again. His third feature, FUGITIVE PIECES, opened last year’s Toronto International Film Festival and is finally finding a home in North American cinemas this spring after a lengthy festival run. This is not the first but rather the fourth time he has found himself showcasing his work at one of the world’s most prestigious film festivals. After pursuing his studies in film at Toronto’s Ryerson University and the American Film Institute in California, one of Podeswa’s earliest short film works was given a spot at the fest. His first two features, ECLIPSE and THE FIVE SENSES, followed the same path and brought him opportunities to work on numerous television series, ranging from SIX FEET UNDER and NIP/TUCK to QUEER AS FOLK and CARNIVALE. While these vastly different shows have given him the chance to shoot around the world, it is his love for Michaels’ novel that has brought him home to Canada for his first feature in eight years. I caught the Genie award-winning director just hours before he would fly home to Toronto for a few days of rest – a concept that has become elusive in his new life. He was here in Montreal to support the latest stop on the FUGITIVE PIECES promotional tour, screening as part of the Festival de Nouveau Cinema. It was early; he hadn’t had a chance to have breakfast and I blew in there just on time, having just come from stuffing my face. Considering this, he was extremely pleasant, insightful and open about his success, the difference between television and film direction and the delicate process of translating a beloved novel into something he could call his own while not angering the entire literary community. 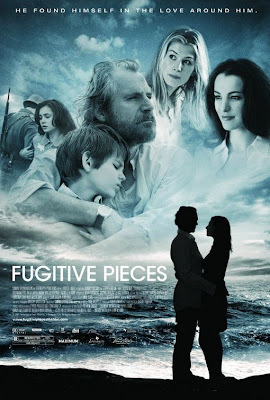 Joseph Belanger: FUGITIVE PIECES is obviously not your first taste of success but it seems to be making some major waves, which is just fantastic for you. Congratulations, by the way. How are you handling everything considering where it seems this all going? Jeremy Podeswa: Thank you. I think when you’re inside of everything, it feels different than what it looks like on the outside. For me, I’ve been making films for a long time, directing television, doing other things. Obviously, this is a big project for me but it doesn’t feel like my life is changing. It feels more like a further outgrowth of what I’ve already been doing. We’ve had nice things happen, like opening the Toronto Festival and people responding well to the film but the work is the work. For me, the important thing was to make a faithful adaptation of Anne Michaels’ novel and people are responding very well to that. That’s the biggest achievement for me. JB: At what point in time, when you were first reading Anne Michaels’ novel, did you think, “This would make a great film and I could make this a great film”? JP: I read the book when it was first published, ten years ago. I was already a filmmaker at that point. However, I didn’t think that I was the kind of filmmaker who would ever get to make a movie like this. I was making very small, intimate movies and this was clearly a big, sprawling story. It didn’t occur to me for a second that I would be the person to make this movie but as I was reading it, I did think there was a beautiful movie potentially in it. It’s so poetic and beautiful and deep, I thought somebody is going to make a great movie of this someday. JB: So how did it come together then? JP: I had heard, very shortly after the book was published, around the same time that THE ENGLISH PATIENT got made, that there was interest from Hollywood in doing a very similar kind of movie and I thought that was going to happen; it would just go to Hollywood. It would be made as this big, gorgeous thing but it will have nothing to do with me. Then, five years later, after I had just got back from Cannes with my second feature, THE FIVE SENSES, I found out the movie rights had been sold to a Canadian company. I wondered what they planned on doing and I approached them at that point. As it turns out, they were actually looking for a director at that point and I thought I was ready to do it finally and if they want me to do it, I’m there. JB: Obviously, they did want you and I’m glad they did. As you said, it’s a very ambitious project that stretches across continents and decades. Comparatively, with your television work, that is arguably more limited in terms of scope, how does it feel to get outside of that? JP: I’ve actually done a lot of television which is not just two people in a room talking. I’ve actually done a lot of period stuff, from ROME to INTO THE WEST, CARNIVALE. For me, it’s not such a huge difference in terms of scale. Like ROME, one episode of that cost more than this movie so in terms of budget, it’s not that big of a stretch either. The difference is that I wrote FUGITIVE PIECES and it was something that sat with me for a very long time. It was up to me to create the entire aesthetic of the movie. When you work on a television show, the vocabulary of the show exists already. I tend to do shows that I have a strong affinity for the vocabulary but it’s not my vocabulary. With Fugitive Pieces, we were really creating it from the bottom up. It started with the novel but then from there, I wrote the screenplay and directed it and was involved in casting it and making all the creative choices, in terms of art department and so on. It was up to me to establish how this movie would be realized. It is very different but what TV did for me was give me the confidence to work with such a wide variety of material and in so many different places. It gives you a lot of flexibility and versatility, just comfort with the process. A lot of the fears that I had walking into FUGITIVE PIECES were dissipated or diminished from doing all these other things before. JB: So you did have fears going into this? JP: Well, fears I might have had. With all my past experience, I felt pretty prepared coming into this. 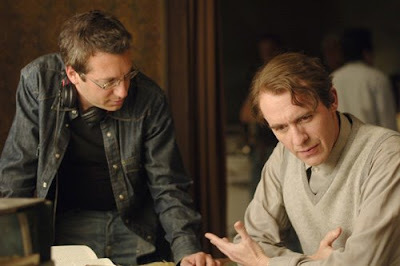 When the movie was finished, I feared how the people who embraced the book would embrace the movie but I think when you’re making something like this, you have to have a certain blindness or imperviousness to these kinds of things and any kind of doubt really. JB: So no catering to the future audiences but does catering to Anne Michaels come into play? JB: One of the major themes in FUGITIVE PIECES is how the past affects the present and subsequently the future. To get this across, it tells its story entirely out of sequence, following Jakob back and forth between manhood and boyhood. When you have to have such a strong connection between two actors playing the same character at different points in his life, how does this affect casting? JP: I think you have to have an intuitive sense in your casting that there’s a spiritual connection between your two actors, that there is an essential aspect to them that they both have that will make you believe that this boy will become that man and within that man is this boy. It’s really instinct in casting and I had a very strong instinct in both of them. Spiritually, essence-wise, they both just lined up in certain ways. I also think they both have this intelligence, that there is something going on behind their eyes. They don’t have to say anything or do anything but there are all these wheels turning. JB: I’d like to finish by getting your thoughts on one of the film’s other major themes, which is the process of healing and letting love in. Do you think the film suggests that we heal ourselves or that we are healed by others? JP: A lot of it has to do with timing. Jakob essentially has two love interests in his life and I think Jakob was just a little more ready to let someone into his life at the point he meets the second woman. Still, there is an essential difference between the two women. His first wife is someone who absolutely has the best intentions and feels that Jakob should be able to start a new life and move on with her. He is absolutely not ready at that point but you can see how she would imagine that’s possible and want that to be true – not just for her but for him too. He’s tortured and she doesn’t want to see the person she loves tortured. Who would? His second wife has no expectations of him changing, which gives him the comfort to actually change because he doesn’t feel any pressure or that he isn’t understood or that his past isn’t being appreciated. Still, he’s done a lot of work on himself by the time he actually meets her. JB: Love comes into your life when you’re ready for it. FUGITIVE PIECES opens in select cities Friday, May 2, and Jeremy Podeswa will next be directing an episode of the Steven Spielberg/Tom Hanks-produced mini-series, The Pacific.